You can easily update multiple user Metric values by uploading a spreadsheet to Hoopla. This is a great method for updating Metrics that are not automatically updated through one of our integrations. You must have a column called Email, populated with your Hoopla users' email addresses. If your users were added via Salesforce, use their Username instead. The column will still be labeled Email. 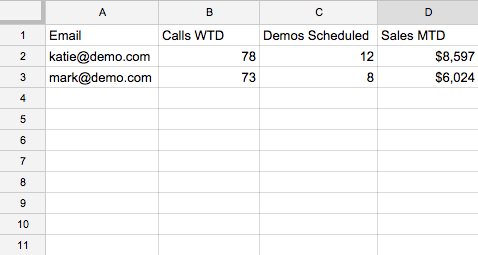 The remaining columns should contain aggregated Metric values for each user. Click on File Upload sub-tab. Drag and drop your spreadsheet file to the grey drop area, or click Choose a File button. The upload status will appear in the File Upload History section of the page, along with any errors.